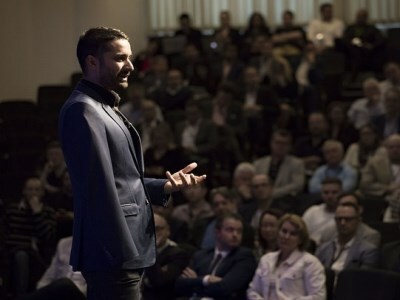 Following a tragic car accident that saw him pronounced dead for three minutes, Sam Cawthorn was told he would never walk again – a setback that would surely defeat many. He has gone on to become an internationally best-selling author, speaking in 36 countries and even sharing the stage with Bill Clinton, the Dalai Lama and Michael Jordan. Along his personal journey, Cawthorn recognised that ‘storytelling’, which is what we are all told to do to “engage” with others, was neither a compelling way to share and nor did it evoke other people into action, the two things that he had set out to do. He realised that the only way to truly connect with an audience emotionally was to ‘storyshow’, revealing vulnerability and inviting listeners to share in his narrative (rather than telling it), and in turn deeply engaging people to overcome their own obstacles, turn crises into opportunities, and use positivity to succeed. Cawthorn, who has also spoken at more than 1,000 schools, says above all else, principals need to be in “the business of emotion” and can greatly enhance their communication through the use of storyshowing. “My accident happened over 11 years ago. Eight months after my accident, I left my job and started speaking at schools,” he said, adding that he was speaking at more than one school a day. “People won’t care about your story at all unless it’s made relevant, so the best way to make it relevant is by showing what it means to the listener,” he said. Cawthorn added that this includes the use of non-verbal communication, gestures, tonality and facial expressions. “If you want to influence people more, make more of a difference in the world and evoke more emotion. The greatest way to get them to feel that story and get them emotionally connected is by showing them why that story is relevant,” he said. Cawthorn said that before setting out to plan a presentation, principals shouldn’t just think about what they are going to say, but how they are going to say it. “Principals need to start thinking about how their message is going to land most effectively with their audience, and how they can incorporate a story with every concept they want to communicate,” he said. Cawthorn said the essence of a story is vulnerability, and this is something that principals should think about when speaking to an audience. “What we want to see in our leaders is someone who says ‘I’ve failed before and been where you’ve been’. That way, we can relate and connect with them better,” he said. Cawthorn said that if principals want to get better at their presentation and storyshowing abilities, the best way to do this is by getting feedback from an expert in this field.